One DeKalb County School District (DCSD) elementary school spent the morning of May 2 spreading good cheer to senior citizens. Students from Dresden Elementary School’s Junior Beta Club and music program visited The Phoenix at Dunwoody on May 2 to perform. 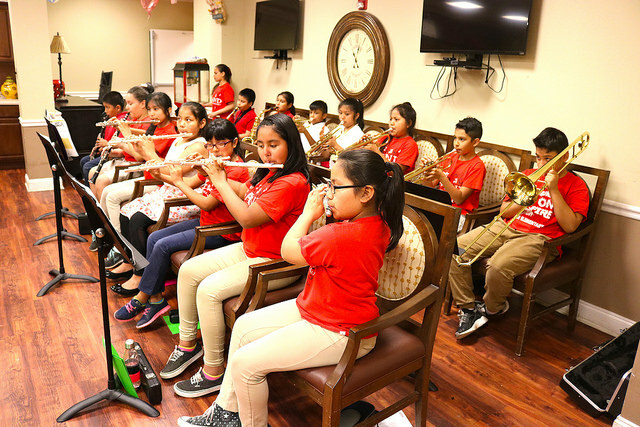 The group of 24 students played three songs for residents while also reciting original and select works of poetry. The band played such classics as “Hot Cross Buns,”; “Merrily We Roll Along,” by Charlie Tobias, Murray Mencher and Eddie Cantor; and “Go tell Aunt Rhody” by Jean-Jacques Rousseau. However, it was Hannelis Rodas’ performance of Phyllis Porter Dolislager’s “Special People”—which details the daily routine of caregivers—that really touched the gathered audience. The students—all fourth and fifth graders—also ate lunch with Phoenix residents after sitting down and writing poems with them. 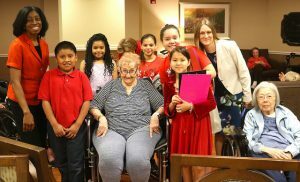 According to Junior Beta Club sponsor Debra Mines, the Junior Beta Club has visited The Phoenix at Dunwoody for the past three years as part of an ongoing community partnership. Mines—whose mother once attended The Phoenix—considers the performance, interaction and visit with Phoenix residents a service, as well as an important lesson to participating students. Students promoted these ideals by mingling with seniors, holding conversations, exhibiting maturity, and respecting residents. “It’s a an excellent project to serve others and to show that our students are growing into respectful, responsible adults,” Mines said. Dresden music club sponsor Angela Rocca began the music school’s program in the 2016-2017 school year. She said the program has grown from 30 to 50 students, the majority of which also participate in Dresden’s Junior Beta Club. Mines said the Junior Beta Club at Dresden has also grown significantly. She said the club’s ability to mold children into ‘whole’ students—students who perform well academically while being socially aware and active in their community—is an ever-present attraction on campus. Of course, field trips to Jekyll Island in Savannah, and other destinations throughout elementary, middle and high school don’t hurt. View more information about Dresden Elementary’s Junior Beta Club and Instrumental Music Club on the school website. View pictures from the Dresden Junior Beta Club.